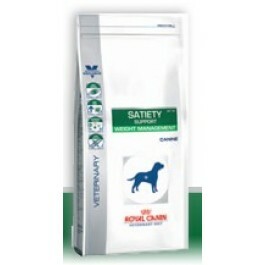 Contains a special blend of fibres that have satietogenic effect on dogs. Enriched with nutrients (protein, minerals and vitamins) to compensate for the effect of energy restriction during a weight loss programme. COMPOSITION: vegetable fibres, dehydrated poultry protein, wheat gluten*, tapioca, maize gluten, hydrolysed animal proteins, maize, wheat, animal fats, beet pulp, fish oil, minerals, fructo-oligo-saccharides, soya oil, psyllium husks and seeds, hydrolysed crustaceans (source of glucosamine), marigold extract (source of lutein), hydrolysed cartilage (source of chondroitin). ADDITIVES (per kg): Nutritional additives: Vitamin A: 20000 IU, Vitamin D3: 1000 IU, E1 (Iron): 44 mg, E2 (Iodine): 4.4 mg, E4 (Copper): 5 mg, E5 (Manganese): 57 mg, E6 (Zinc): 171 mg, E8 (Selenium): 0.08 mg - Preservatives - Antioxidants. ANALYTICAL CONSTITUENTS: Protein: 30% - Fat content: 9.5% - Crude ash: 5.3% - Crude fibres: 16.6% - Metabolisable energy: 2692 kcal/kg.